August sees the height of the summer season with a series of events for the community and visitors alike. 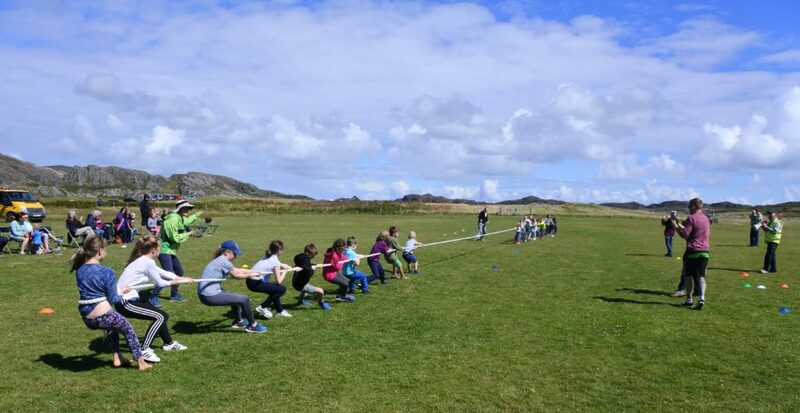 As well as the continuing round of ceilidhs, August is the time for the annual Community Garden Party, as well the island’s Sports Day and the Colonsay Open Golf Championship. 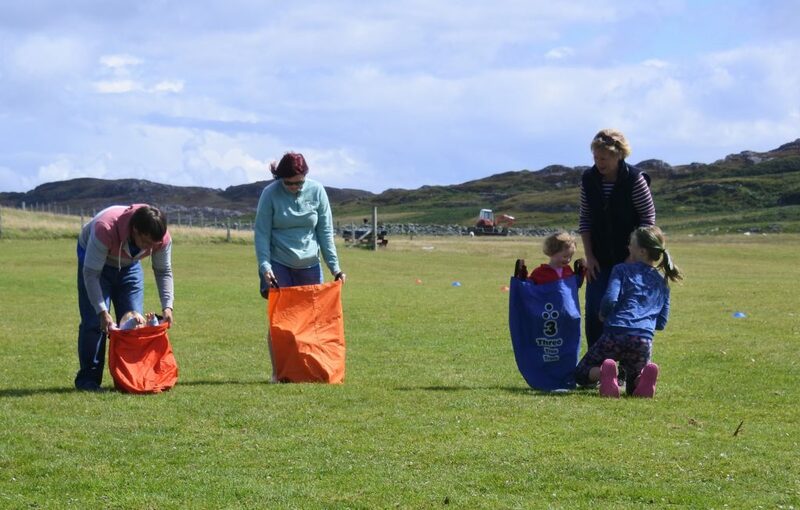 The ceilidhs in August included ones for the Kilchattan Primary School Parent Council, the Scottish Fire & Rescue, and the Colonsay & Oronsay Heritage Trust. The was also a Table Top Sale & Lunch organised by the Hall committee, so there was plenty of entertainment on offer, and thanks both to community volunteers and the support of visitors to the island, all these events were highly successful. Sadly, the Corncrake must also report the passing of Donald McNeill, better known as Donald Gibby, on 18th August at the age of 91. Please see a fuller report below. 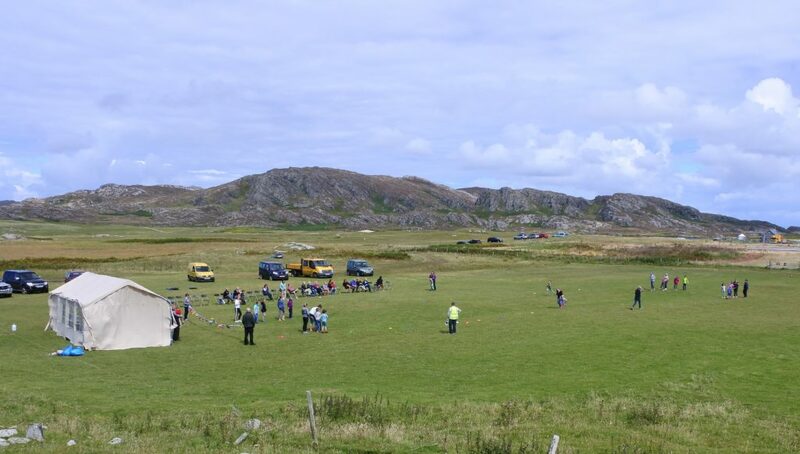 This year the island’s Sports Day was held on 7th August on Machrins, at the end of the airfield. The event was well attended by locals and visitors with races and events mainly for the youngsters, but there were chances for the grown-ups to revisit their childhood too. There was a series of traditional races: Egg & Spoon; Running; Sack and Three-Legged, as well as the Hill Race and a Tug-o-War. With the heats for the races split into different age groups and the number in each heat limited, there was plenty of opportunity for all ages and abilities to shine. 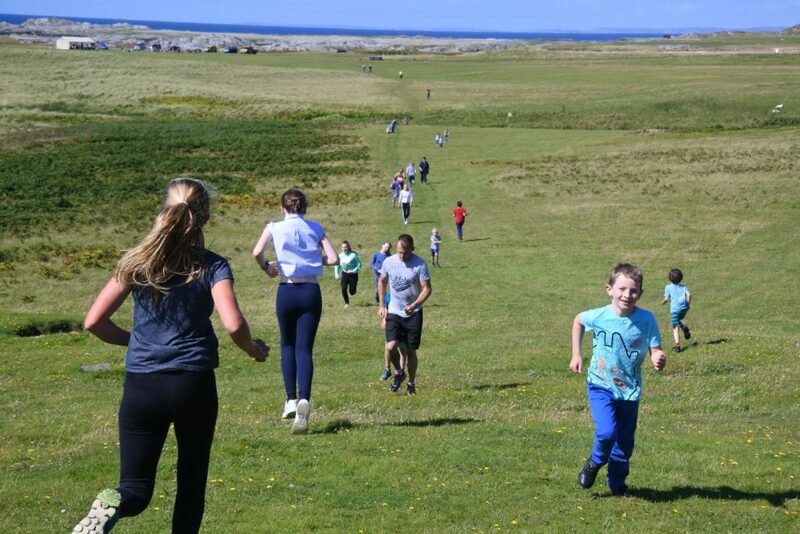 The Hill Race pitted all ages together, and some of the younger runners showed their talent by outstripping many older runners over the taxing course up on to the hill by the gate to Ardskenish and back down to a finish by the event marquee. The Tug-o-War also brought everyone together, though the race steward Jim McLoughlin’s patience was somewhat taxed by a collective inability of the participants to understand simple directions. Who would have thought that picking up a rope, taking the strain and pulling could lead to scenes of chaos and laughter, temporarily at least. Jim’s firm, good-natured control eventually won they day and with order restored a fair pull took place. At the event marquee Grace Johnston and Helen Mann, the event organisers, served refreshments, including a seemingly limitless supply of burgers. The fair crowd of spectators warmed by the summer sun spoke of a day to be remembered, but suggestions that the Editor of the Corncrake got a touch of the sun himself and was actually seen running in an adult race must be some form of collective delusion. The organisers wished to thank all those who participated, as well as those who supported the event, and particularly Jim McLoughlin who officiated with aplomb and good humour. 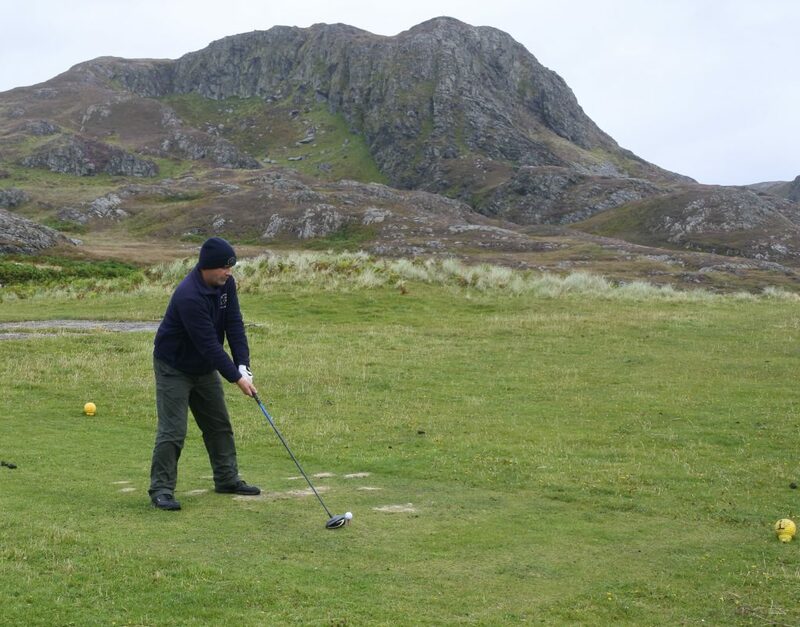 The 2018 Colonsay Golf Open took place on Saturday 19th August in less than ideal weather conditions, but these did not deter a robust entry of over 20. The course itself was in very good repair as this year the greens and fairways have had special attention and been well maintained by Phil Jones, with support from Joe Robertson and Archie MacConnell, particularly in the run up to the Open weekend. 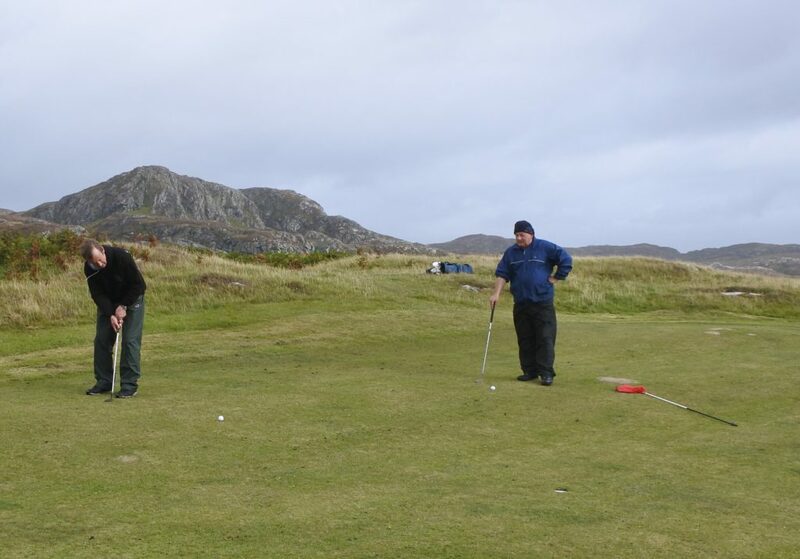 The Colonsay Open combines several events into one, with both open 18-hole Handicap and Scratch competitions, as well as a “Locals” 18-hole Handicap and a Ladies competition. This year’s winner of the open Handicap, and Colonsay Champion Golfer of the Year, was Paul Summers, with a net score of 69, with Brian Sullivan second and Stephen Whitmore third, both on a score of 73. The Scratch competition was won by Walter Ashcroft with a score of 81, and second was Geoff Clark (84) and third was Brian Sullivan (87). The Locals Handicap was won by Chris Nisbet on 75, with Donald McAllister second (76) and David Binnie third (76). The Ladies competition was won by Caitlin McNeill, with Holly Nisbet second and Sue Dance third. 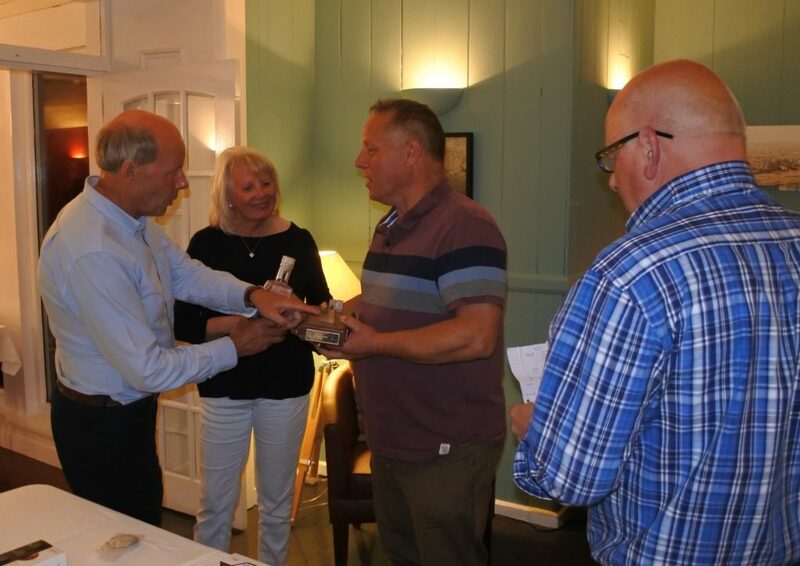 There were additional competitions for ‘longest drive’ , won by Joe Summers, and ‘nearest the pin’, which was won by Geoff Clark. 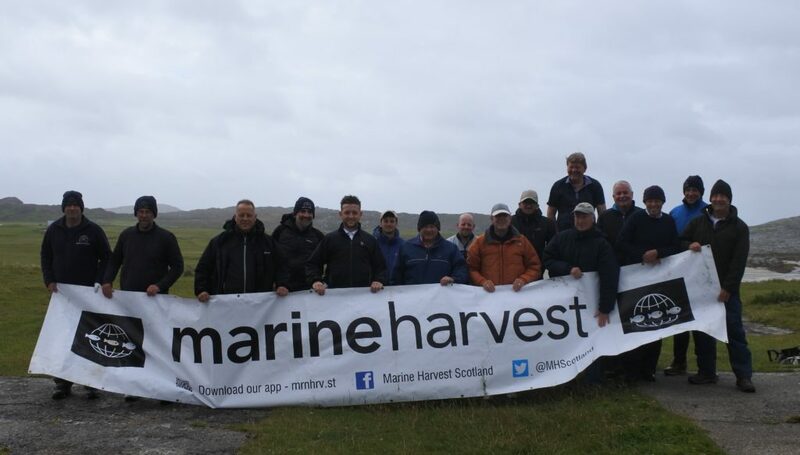 The Colonsay Open was sponsored by Marine Harvest, MacLennan Motors, Curries of Islay, and Travis Parkins. 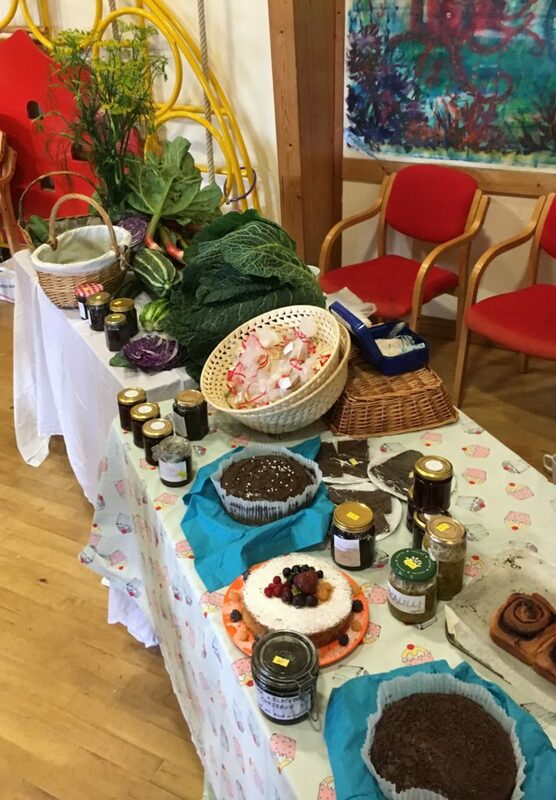 This year’s Community Garden Party was held at the Community Garden on 6th August, though events were forced in doors in the Hall due to the inclement weather. 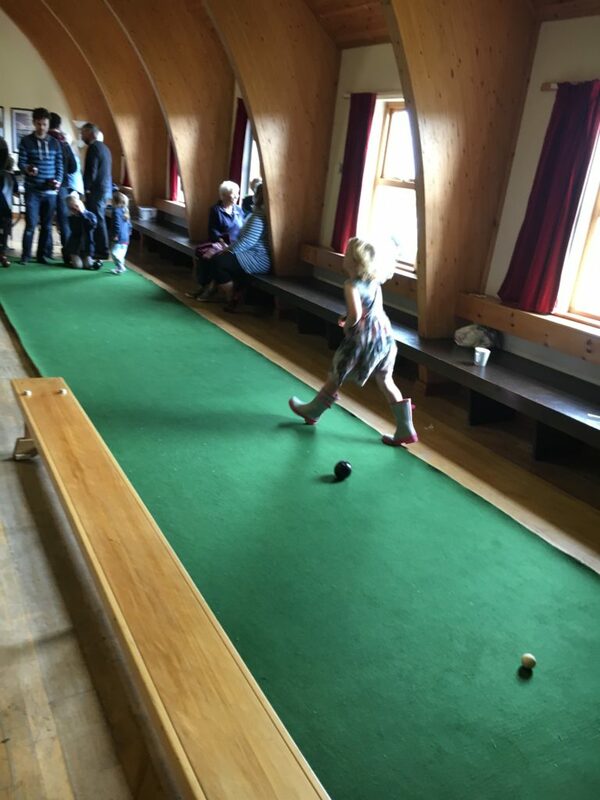 This enforced adaption did not detract from support for and participation the event, and there were indoor games including bowls as well as stalls with local produce and a traditional tombola. This is the main fund raising event for the Community Garden and proved very successful raising over £500, which should meet the sums that need to be spent on maintaining the garden and buying in new plants, bulbs and trees. The bulk of the maintenance and new planting is of course done by volunteers, who are always welcome. 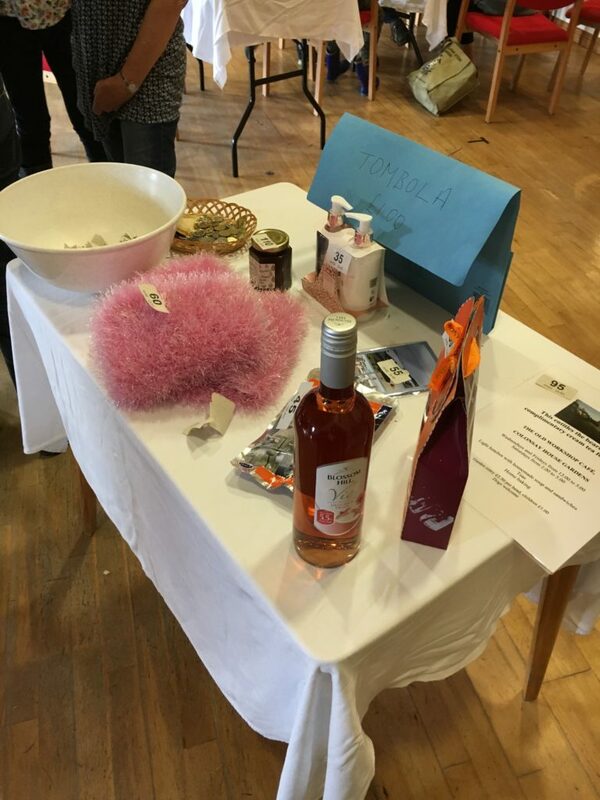 The Village Hall Committee had a Table Top Sale and Summer Lunch on Sunday 13th August at the Village Hall. This was a varied and entertaining event hosting a mixture of car boot, bric-a-brac, art & crafts, and traditional homebaking. The additional lure of lunch made for an enjoyable afternoon event, which this year raised nearly £650 towards Hall funds. A funeral service for Donald McNeill, better known on Colonsay as Donald Gibby, took place at the Church of Scotland Scalasaig on Thursday 24th August, followed by a service of committal at the Kichattan graveyard. The Corncrake is grateful to Kevin Byrne to be able to include this abridged version of Kevin’s address given at the church service. “Known to us all as Donald “Gibby”, Donald McNeill was born in 1925 at Baile Iochdrach, the eldest son of Gilbert McNeill and his wife Effie MacPhee. With his brother Dotie, by whom he was recently pre-deceased, Donald came of very ancient stock, being descended on the one side from Iain a’ Chuain and on the other side from Colonsay’s own Clan MacPhee. He was born into a Gaelic-speaking household and had no other language until he went to school. He left school at 14, with the outbreak of the war and, as a lad of about sixteen, Donald found and recovered the remains of a casualty from the Arandora Star. His work that day, together with his father, brought some comfort to the family of the deceased and led to the remarkable fact that all residents of Colonsay have been made honorary citizens of the Italian town of Borgo val di Taro, Giuseppe Delgrosso’s birthplace. Soon afterwards, in 1943, young Donald was conscripted and sent to work in the coal mines, initially in Fife and subsequently in Kent. He was one of almost 50,000 youngsters who were quite literally selected at random; they were known as Bevin Boys and made a vital contribution to the war effort, working in arduous, dangerous, alien conditions and never granted the recognition that they deserved. It will have been with no little sense of relief that Donald was eventually demobilized and allowed to return home, where he worked for a while on one of the farms before he set himself up as a lobster fisherman. Donald’s seamanship was legendary, and so was his ability as a fishermen – as John McPhee later commented, Donald “knew the name and address of every Colonsay lobster”. Apparently in those days, working with a crewman, he could hope to get sixty or seventy lobsters on one of their best days, but ordinarily had to be content with “only about thirty”! Some ten years later, in 1957, Donald’s father retired and he paused from the fishing to take over the croft – that was a big year, because in the same year Donald and Maggie were married. They lived at first in the old family home, now known as Cnoc nam Ban, and of course even then there were few of the comforts that we now take for granted. They were blessed with two daughters, Effie and Flora, whose devotion to their parents has been an inspiration to us all. It must have been about then that Donald became the ferryman, operating the flit boat to the old Lochiel, and transferring passengers, cargo and livestock in all weathers. It was a demanding and highly responsible position, heavily reliant upon good seamanship and commonsense in the days before written regulations for Health & Safety. The whole process was fraught with peril and Donald himself became a victim on the 8th October 1960, in events that were long remembered. It was a Saturday, and Donald’s work had included ferrying 40 of his own sheep out to the Lochiel, to be sold on the mainland. Famously, just a few hours later, and in calm conditions, the Lochiel ran straight onto a charted rock in Loch Tarbert and sank. Fortunately there was no loss of human life, but the livestock and eight motorcars came to grief; a few of the sheep got ashore and were later recovered but, by all accounts, their “rescuers” wanted to charge for lairage. In those days, under the Conditions of Carriage, everything was “at your own risk” and there was to be no compensation; at the time it will have been a serious loss to the young married couple. A little later, in the early 1960s, the pier was built and Donald became Colonsay’s first pier-master. In those days he was in the coastguards, and was also the Special Constable; I am not sure how strict he really was, but some of the youngsters of the day used to mutter about him being an “Extra-special” Constable; at all events, the position was another mark of his respected position in the community. There were still quite a few active crofters in Colonsay at the time, but by a quirk of fate Donald came to be a symbol of them all when a young and talented writer for The New Yorker came to stay in Colonsay, in search of his roots. This was John McPhee, whose book “The Crofter and the Laird” has never since been out of print; as long as libraries survive, Donald, Maggie and their household will be immortalised. His employers at MacBraynes clearly understood that Donald’s skills of seamanship were too good to be wasted, and he was persuaded to become the ferryman for Iona. Donald and Maggie and family moved with the work and therefore had to spend some years away from their beloved home in Colonsay, returning only for the holidays. Since Iona was a much busier destination than Colonsay, Donald’s “people-skills” were severely tested by the hordes of summer visitors, giving rise to stories that lost nothing in their telling. We have to hope that the visitors were as appreciative as everyone else. September promises an extended Music Festival to mark its tenth anniversary. A full report will appear in the September Corncrake. The October Festival is schedule for the 14th to 28th October, and promises of veritable feast of events focusing on food and drink from Colonsay and Scotland. An in depth article on the Heritage Trust is in preparation. The Editor would like to apologise to readers for the delay in getting this issue of the Corncrake to press. This was due to ill health in the Corncrake’s editorial team, and it is hoped timeliness will be restored with September issue. The full Corncrake for August will soon appear as a pdf on the website and in hard copy at the Post Office.